Come decompress at the Otacafe, where you can hang out or perform. The stage will be open most of the convention for open-mic karaoke, and we'll have tables provided for mingling and eating. You may sign up to sing only once at a time. This means that, until you sing, you cannot sign up to sing again. This includes singing as a group with your friends: If you were signed up to sing when your friends signed up to sing, you cannot go with them. Other people are patiently waiting their turn to sing, you can do it too. While we do allow English versions of songs from anime, we ask that you refrain from requesting to sing American/European popular music or rock. In other words: if it's not in Japanese or it's not from anime or a Japanese video game, it's not allowed. Please throw away any trash that you generate. 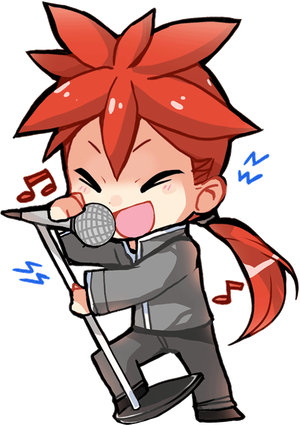 The Otacafe is as much a place to socialize as it is to come and sing; However, chatter while people are singing is very impolite to the singers, so we would like to request that, when people are singing, you try to keep your voices down to a normal conversational level (i.e. no shouting, shrieking, etc.) and you restrict all talk to the area with the tables in the back of the Otacafe. If you are sitting in the audience seats, we would appreciate it if you would respect the singers and not speak at all during a performance. Otakon® is an annual celebration of Asian pop culture (anime, manga, music, movies, video games, etc.) and its fandom! Otakon is run by the non-profit organization Otakorp, Inc.
Otakon is held in the 2,300,000 square-foot Walter E. Washington Convention Center, located in our nation's capital, Washington, DC. Copyright © 2019 Otakorp, Inc. All Rights Reserved.